Throughout the 1960s, Marlon Brando became increasingly active in social issues. Though his popularity was plummeting, he sought to make art that was relevant to the changing cultural landscape. The Ugly American (1963) is a well-intentioned (though drab) warning against imperial practices in Asia. Reflections in a Golden Eye (1967) despite its drawbacks, is at least a noteworthy early example of an explicitly homosexual character in a mainstream Hollywood film. 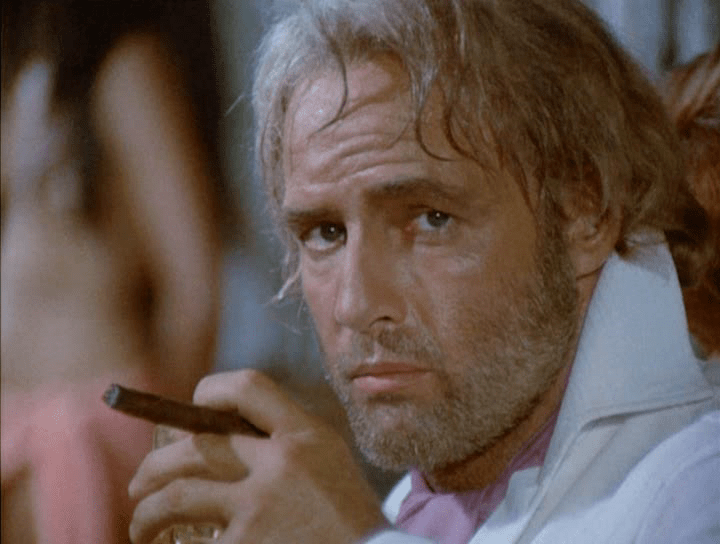 Brando’s supporting appearance in Candy (1968), a notoriously unwatchable satire based on Terry Southern’s novel, may have missed the mark, but still shows Brando’s intellectual sympathy to the counterculture. At least, that commitment was true when he wasn’t just grabbing a paycheck – this time period is wrought with almost as much vapidity as “important” work. However, after the 1968 assassination of Martin Luther King, Jr., Brando vowed to make only important, socially conscious films that could help change the world. That was also the moment at which he completed his long-term contract with Universal. He was finally free from the constraints of the conservative studio and could embark on personal projects again. Just a short time earlier, Brando saw Italian filmmaker Gillo Pontecorvo’s politically radical The Battle of Algiers, an incendiary and widely lauded chronicle of the French/Arab conflict. It was just the kind of film Brando wanted to make, now that he had the freedom to make such decisions. The result of their collaboration is Burn!, a violent, difficult, passionate screed against Western colonialism in South America. The film tells the story of a fictional Caribbean island named Queimada (Queimada is the original, Italian title of the film) during the mid-19thcentury. As the film begins, Queimada is under the control of the Portuguese – we are told that when they conquered the island, they burned it completely to quell the insurrection of the natives. However, there remains a murmur of unrest among the African slaves who have been producing sugar for generations. Enter Sir William Walker (Brando), an upper-class Englishman who arrives to the country just in time to see an old acquaintance, a rebel, killed by Portuguese military. Alternately hobnobbing with sugar barons and training and arming a rebel militia (led by handpicked General Jose Delores (Evaristo Márquez)), Walker becomes almost single-handedly responsible for overthrowing the Portuguese and providing freedom to the slaves of Queimada. Obviously influenced by the Marxist cinema of Eisenstein, Pontecorvo shoots with a bold style, using handheld, documentary-style camerawork and editing with jagged, elliptical cuts that are powerful in what they choose to reveal or hide. One such cut takes us from Walker teaching a group of rebels how to load a musket to a shot of the aftermath of their first battle, a pile of dead Portuguese soldiers on the ground with the rebels celebrating in the background. Like pure capitalism itself, the film argues, Walker must evade morality at all costs in order to ensure his success. He is a purely rational machine, and winning is his only desire. Even a final display of decency toward Delores, the man he molded into a hero, is at best a cynical ploy to satisfy his conscience after a job well done. But there is also prescience in the film’s sermon, an unsettling reminder that whether it is South America in the mid-19th century, Asia in the mid-20th century, or the Middle East in the early 21st century, the spirit of William Walker remains alive and well.